Will Eating Chocolate Make You Fat? “Will eating chocolate make me fat?” This question gets 138 million searches on Google every single day. At Wellsource, our mission is to empower people to enjoy the longest, most satisfying, and productive quality of life possible. So we notice when studies suggest that eating a particular food – like chocolate – can help you live longer and maybe even help keep you slim. To be honest, we like dark chocolate. But we also read studies that show eating chocolate contributes to weight gain. So what’s the right answer? Should health and wellness professionals eat chocolate and recommend others eat it too? Wellness professionals should never trust a single study. Look at many studies, giving heavier weight to systematic reviews and meta-analyses. In the case of chocolate, there are many studies that argue both sides of the coin. After reviewing some of the studies on this topic, including systematic reviews and meta-analyses of randomized trials, we believe the answer may lie in moderation. Moderate chocolate intake has been shown to help lower blood pressure, improve insulin sensitivity, and improve HDL, LDL, and total cholesterol levels. Several prospective studies have shown that eating chocolate is linked to lower cardiovascular and all-cause mortality. Chocolate is a very rich source of antioxidants, including polyphenols and catechins, that help protect the cardiovascular system. 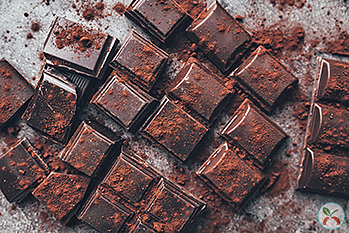 In an animal study, these cocoa-derived antioxidants increased capillary formation and muscular performance. These nutrients also increased lean muscle mass and reduced body weight (in rats) – without reduced calories or increased exercise. One study found that people who eat chocolate frequently have a lower body mass index (BMI) than those who eat chocolate less often. And that's even after adjusting for confounders like physical activity. It doesn't seem logical, but the findings are supported by similar studies that looked at the health benefits of cocoa and chocolate. The authors of this study said, "Our findings that more frequent chocolate intake is linked to lower BMI are intriguing." 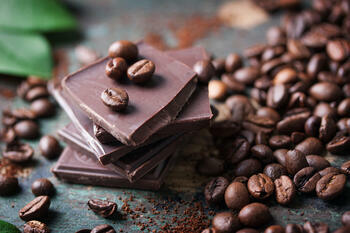 If you enjoy chocolate (especially dark chocolate) eating a little may not be harmful and may be beneficial. But just to be sure, add in a little extra exercise with your chocolate. It will help you burn the added calories. If you don't want the fat and sugar found in most chocolate candy, you can try a cup of hot chocolate. The benefit is in the chocolate, not the sugar and added fat. And no, this study was not paid for by the chocolate industry. It was funded by a National Institute of Health, Heart, Blood, and Lung Institute grant and was conducted by the University of California, San Diego. A recent systematic review of chocolate clinical trials concluded that there is a marginal, but statistically insignificant reduction in weight and BMI. Eating chocolate had no effect on waist circumference. However, the study authors pointed out that chocolate studies have been small population studies, and recommend that future trials include larger populations. So how much dark chocolate can you eat? A recent meta-analysis of 23 studies found the ideal amount of chocolate for reducing cardiovascular risk is 45 grams a week, or about 4 squares. But you must remember that those four squares add over 200 calories to your diet. Wellsource is committed to scientifically validated, evidence-based science. For optimal health, we recommend proper nutrition, including limited intake of sugars, paired with adequate physical activity. Go ahead. Eat a small square of dark chocolate a few times a week, if you’d like. Just be mindful of the added sugar, fat, and calories. Want to learn more about how to improve your population’s nutrition? Download our health challenge on nutrition to power your next wellness initiative. Note: This blog was first published April 23, 2012 and updated in 2019 to remain current with the latest standards and guidelines.